Friedrich Leopold August Weismann was born on January 17, 1834 in Frankurt, Germany. His father was a high school teacher and graduate in ancient languages and theology. His early education took place in Frankfurt and at 18 he left to go to the University of Gottingen where he studied medicine, graduating in 1856. After graduation he took a job in the city clinic in Rostock and successfully submitted two papers, one on the synthesis of hippuric acid in herbivores and one on the salt content of the Baltic Sea. He served as the physician of the Archduke of Austria from 1860 to 1862. He studied zoology at the University of Giessen under Rudolf Leuckart and in 1863 he became privadozent in comparative anatomy at the Albert Ludwig University of Freiburg in Breisgau. He was made extraordinary professor in 1866 and was full professor from 1873 to 1912. He was the first chair in zoology and served as director of the zoological institute. Due to problems with his eyesight there were long periods in which he was unable to do microscope work and his reading and writing was done with the help of others. Weismann's biological studies led him to theorize that in multicellular organisms there were two type of cells, germ cells and soma cells. Germ cells, such as sperm or ova, are the carriers of biological information, the means by which traits of parent cells were transferred to daughter cells. Somatic cells were the offspring of germ cells and carried out the biological functions of the organism. These somatic cells did not transfer information to future generations. Before the discovery that chromosomes are the means that cells use to transfer genetic information, Weismann's germ cell theory was an important stepping stone, holding that biological traits come from within the organism and do not arise from an external mechanism. 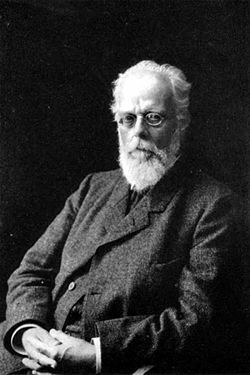 For his work Weismann was awarded the Linnean Society of London's Darwin-Wallace medal in 1908. Weismann died on November 15, 1914.